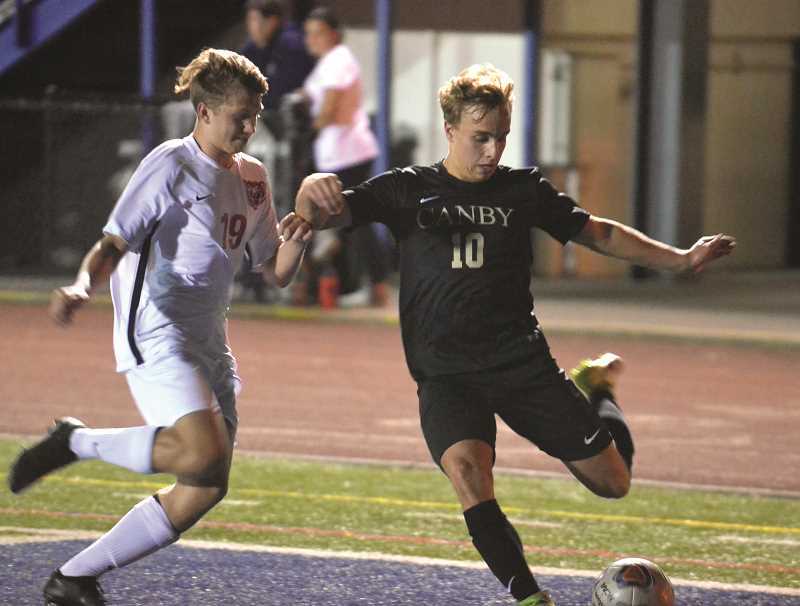 In its last preseason game, Canby made the most of it. The Cougars picked up their biggest win of the season in a 6-2 defeat of the visiting McMinnville Grizzlies on Wednesday, Sept. 26. The win was Canby's second of the season, and second in the last three games. "They're starting to believe," JV head coach Brad Matlock said of his team after the game. "What we've been teaching them since day one, since they were freshmen, whenever they got here, they're starting to believe. I think that's the difference. It's the confidence, they're trusting each other, and they're playing to their potential finally." The game started off with both teams battling for possession of the ball, and Canby finally making it down into Grizzlies territory. A hand ball was called just outside the box on the away team, and Canby was given a free kick opportunity. The Cougars capitalized with senior forward Thijs Pepperkamp nudging the ball off to senior Kristopher Lopez, who promptly blasted the ball through the defenders feet to find the net at 28:25 of the first half. "I have a great relationship with the team and we're all starting to bond and grow together as a team, and I think that first goal really helped out," Lopez said. "Especially with me being a captain to help set the tempo." Canby found a lot of its success in the first half off of breakaways. The second goal of the came from junior captain Ian Quinlan who scored off of a fast break where he beat defenders and the keeper to improve the home teams lead to 2-0 at 26:31 of game. That was the first of many goals for Quinlan. "The boys have been working really hard as a unit, and we've been putting in extra hours just trying to come together as a team," Quinlan said. "It paid off tonight, we've been playing as a team. We were looking up, passing, and doing what a team needed to do. It's pretty big because now we've got momentum, and now we can run off of it." After the offense pressed the action for the next four minutes, Quinlan got his second goal, sneaking the ball into the right side of the goal past the McMinnville keeper and the near post from the right side. 3-0 for Canby at 22:10 of the first half. 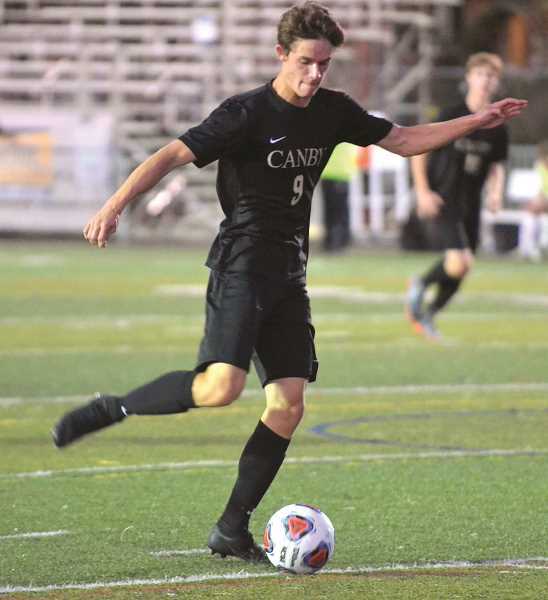 The next goal came from sophomore Francisco "Kiko" Cabello, who capitalized on a Lopez corner kick and headed the ball at around the 18-minute mark. The Cougars still didn't let up, with Pepperkamp, Quinlan, and others taking shots at the goal. Quinlan had a shot bounce off of the side bar around minute 15. It wouldn't be long though before he would have his third goal of the night, with Pepperkamp getting his second assist in the game. "Thijs and I have been working on different runs as strikers and finding different breaks in the defense," Quinlan said. "It's not so much about the skills of the defense, it's more of where they lack positioning. Then you find those holes and work through them." The score stood at 5-0 with 11:54 to go in the first half. The final goal of Canby's streak came 5:52 of the half, making the Canby lead 6-0 and giving the Cougars a commanding lead. McMinnville hung tough though, and managed to get points back. Before the end of the half, junior Hector Cisneros got his first goal of the night with 3:59 to go. Cisneros struck again in the second half, scoring at 20:19 to make the score 6-2. That would be as much of a comeback as the Grizzlies would make, however, as Canby held onto the lead to claim its second win of the season. "It was extremely important," Lopez said of the win. "We've had a rocky road, not only this season, but the previous season and to get the win like this, 6-2, was very important to build up our confidence." With the win, Canby improves to 2-5-1 overall and moves into league to face off with Lakeridge (1-6-1). Against the Three Rivers League opponent, the Cougars expect a battle. "I've played Lakeridge in the past, and they're a pretty good team," Quinlan said. "But I think that if we play how we did tonight against them, then it will be a good match."